It's a lovely art-y interior. 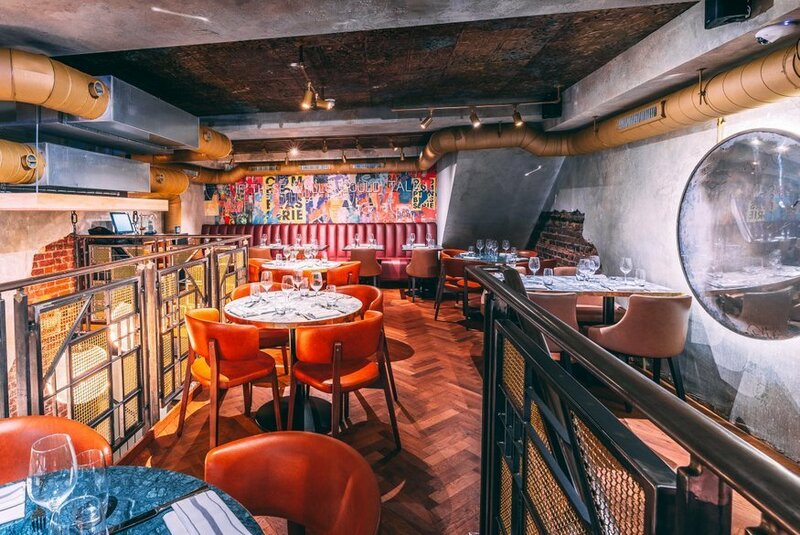 Soho's Old Compton Brasserie aims to capture the spirit of the area, with art covering the walls and cocktails named after past Soho regulars including Charles Dickens and Francis Bacon. You know you're in for a treat when an Earl Grey infused cocktail arrives in a floral tea cup and the sourdough bread is still steaming, fresh from the oven, and things only improve from here. A generous helping of truffle mushroom gnocchi. The gratin starter is stuffed with a hefty helping of prawns and crab that gets dinner off to a meaty beginning. Many restaurants are trying their own take on mac 'n' cheese but this version is one of the more worthwhile variations we've tried. In contrast the smoked salmon starter disappoints, as it's overpowered by its beetroot infusion. Charred vegetables and caviar add some crunch and flavour to the sea bass. 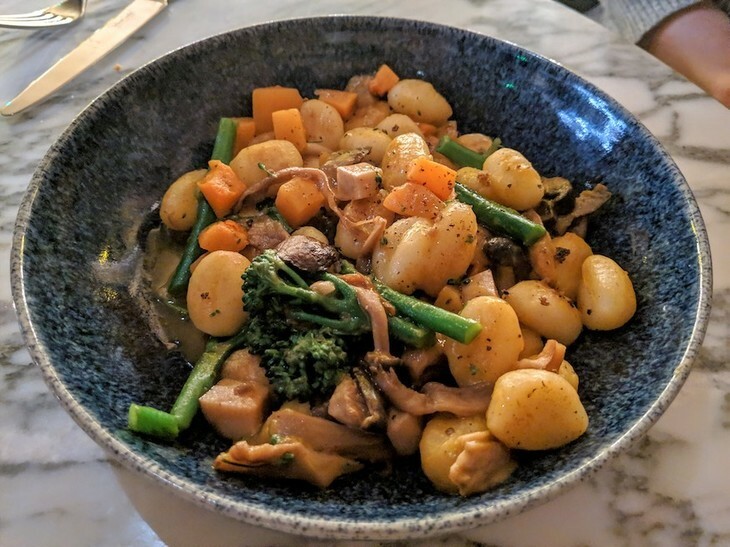 Mains come in generous helpings with the truffle mushroom gnocchi offering more than an average diner could want, a welcome bucking of the trend for serving gnocchi in too-small portions. Belts will need unbuckling to finish it. 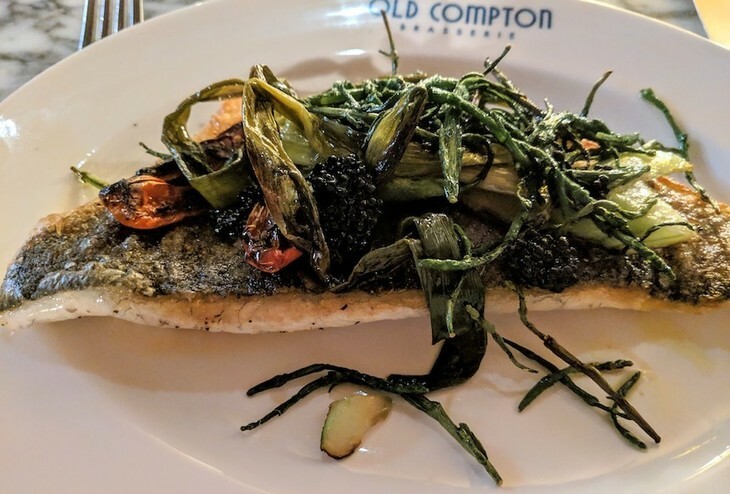 Sea bass is always a solid choice but here, the charred vegetables and caviar make for flavoursome toppings and add a crunchy texture that contrasts beautifully with the silky smooth fish. The mountainous scrumptious berry pavlova. 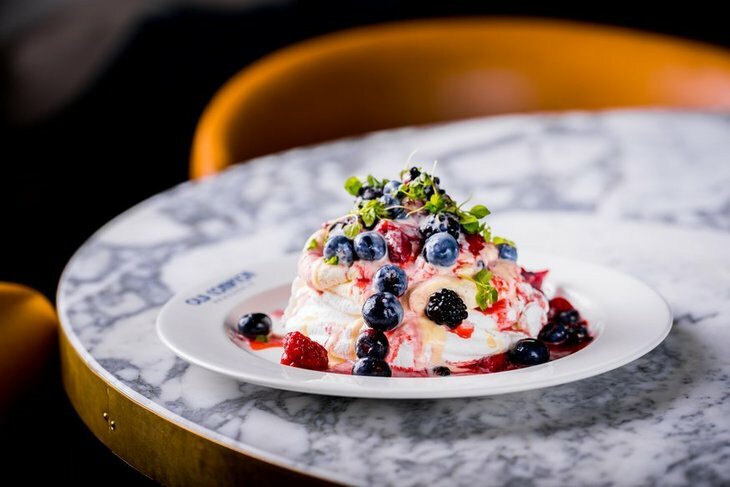 The berry pavlova sharing dessert is a mountain of sweetness. The rich white chocolate and berries deliver a sugar hit that even those with a saccharine tooth will struggle to demolish. With flavour and helpings both in abundance, and a value for money menu to boot, this is an easy recommendation for any visitors to Soho looking for a slice of contemporary British cuisine. Old Compton Brasserie, 34-36 Old Compton Street, Soho, W1D 4TT. The meal in this review would cost around £65 for two excluding drinks.